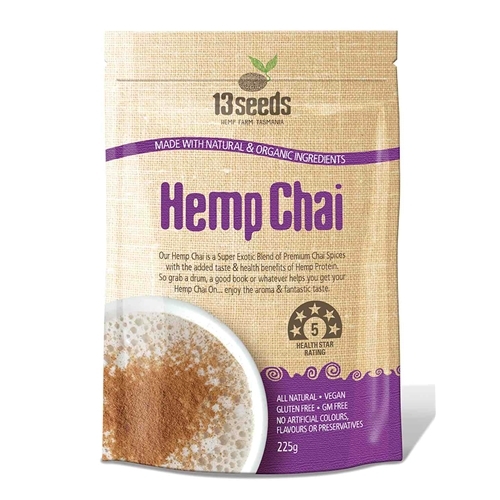 Our Hemp Chai is an exotic blend of Premium Chai Spices with the added taste and health benefits of Hemp Protein and Fibre. Our Hemp Chai is indulgence at its finest. Warm and wholesome. The perfect 'me time' treat. GM Free, Dairy Free, Gluten Free, Low GI, Low Sodium, No Artificial Colours or Flavours, Preservative Free, Vegetarian. Ingredients: Raw Sugar (Organic), Hemp Protein (Chem Free NZ), Ground Ginger, Ground Cassia, Ground Cloves, Ground Cardamon and Ground Star Anise.